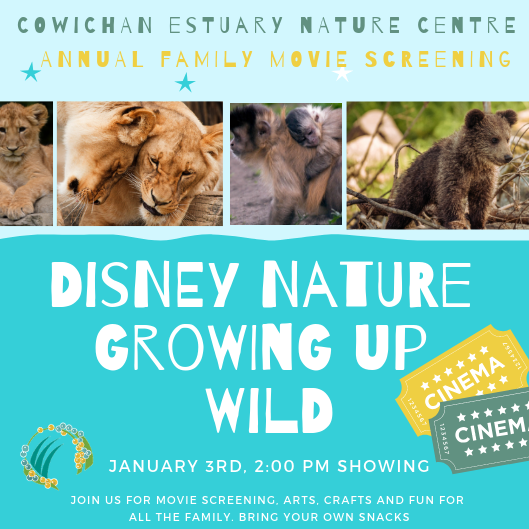 Come join us for our FREE annual new years family movie on January 3rd at 2pm. A fun event for the whole family, including arts and crafts. You are welcome to bring your own popcorn or movie snacks. Stay for a bit and visit the critters in the touch tank! Donations to support the Nature Centre are always welcome. The Nature Centre is hiring! 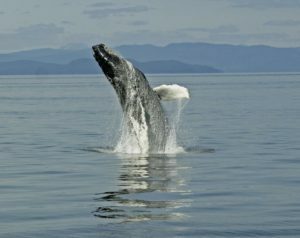 The Cowichan Estuary Nature Centre is hiring! The Cowichan Estuary Nature Centre Administrative Support person works under the direction and supervision of the Cowichan Land Trust Executive Director and the Chair of the CENC Operations Committee, reporting to and being supported by the ED and the Operations Committee, including attendance at the Committee’s monthly meetings. 15 hours a week at $18/hr to start. Depending on funding, hours could expand or this could develop into a Centre Coordinator position at a higher hourly wage with benefits. Please submit applications by November 6th at 12:00pm. Anticipated start date: November 15, 2018. 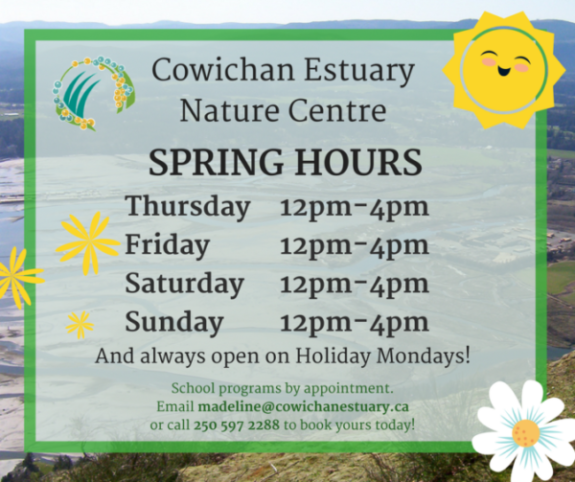 This Spring Break, head down to the Nature Centre for events, activities, and as always – lots of learning and love for our estuary. We are open to the public from Thursday to Sunday, 12pm-4pm. Weekend Workshop/Retreat Feb 10-11th, 9–5 pm, Providence Farm (on the traditional and unceded territory of the Quw’utsun People), St. Anne’s Building. 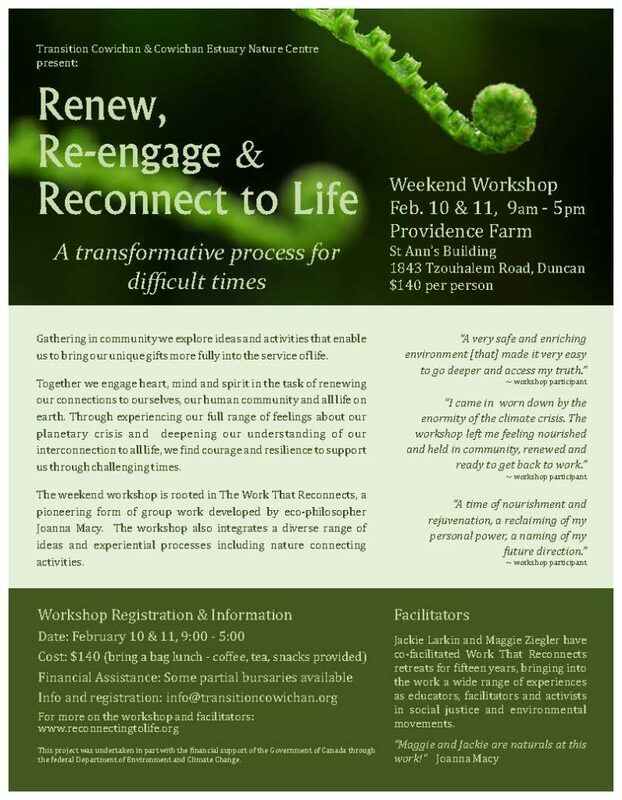 The Cowichan Estuary Nature Centre and Transition Cowichan and are pleased to bring Jackie Larkin and Maggie Ziegler back to the Cowichan Valley to lead a two-day “Work That Reconnects – Reconnecting to Life” Retreat February 10th – 11th. Maggie and Jackie – educators, activists and facilitators who trained with eco-Buddhist philosopher Joanna Macy — have co-facilitated this experiential process for over sixteen years. 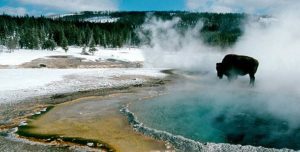 Rooted in a pioneering form of group work developed by Joanna Macy, this workshop/retreat will integrate a wide range of ideas and experiential processes, as well as time in nature. Participants will be supported to engage heart, mind and spirit in the task of renewing our connection to ourselves, our community and all life on earth. “The Work that Reconnects” emerges from the historical movements for social justice and for environmental sustainability as well as from spiritual traditions that honour the earth as sacred. It draws on the ideas and processes of deep ecology, systems theory and modern science. If you’ve been overwhelmed by the unraveling of our world over the past year (..or years) – the climate crisis, environmental destruction, species extinction, violent conflict, increasing inequality – this is a time for connection and renewal. Through experiencing our full range of feelings about our planetary crisis and deepening our understanding about our connection to all life, we can find courage and resilience to support ourselves and each other through these challenging times – and find meaningful and nourishing ways to continue to engage in the work that is needed. This two-day non-residential retreat on Feb 10th-11th is $140 per person. Some partial bursaries (up to 50%) are available. Space is limited so registration is required. We ask that participants bring their lunches. Coffee, tea and healthy snacks will be provided. 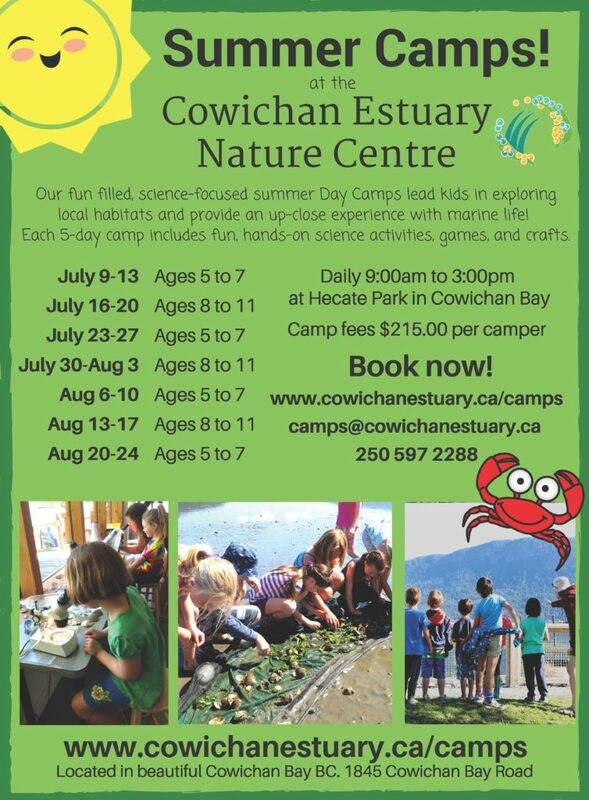 For information and registration contact: info@transitioncowichan.org. If you need a place to stay in the Cowichan Valley, billeting can be arranged. 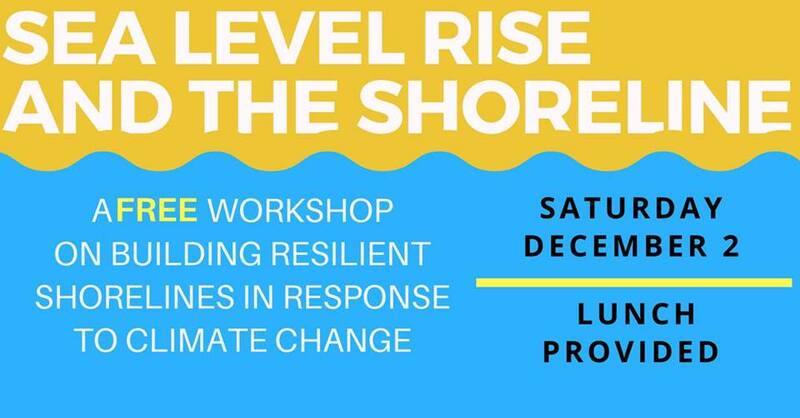 Join us on Thursday January 18th at 7pm at the Cowichan Estuary Nature Centre in Cowichan Bay to watch and discuss this film on climate change and adaptation. 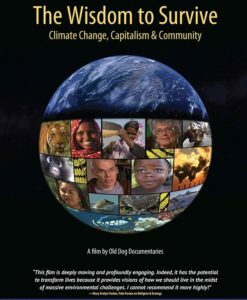 The film features breath-taking photography and inspiring activists and thought leaders from science, economics and spirituality, including eco-philosopher Joanna Macy who developed “The Work that Reconnects” – a pioneering form of group work that engages heart, mind and spirit in such questions. This moving film sets the stage to discuss how we can take action, locally and globally in the face of climate disruption, while also opening ourselves to connecting with each other and the beauty that surrounds us. 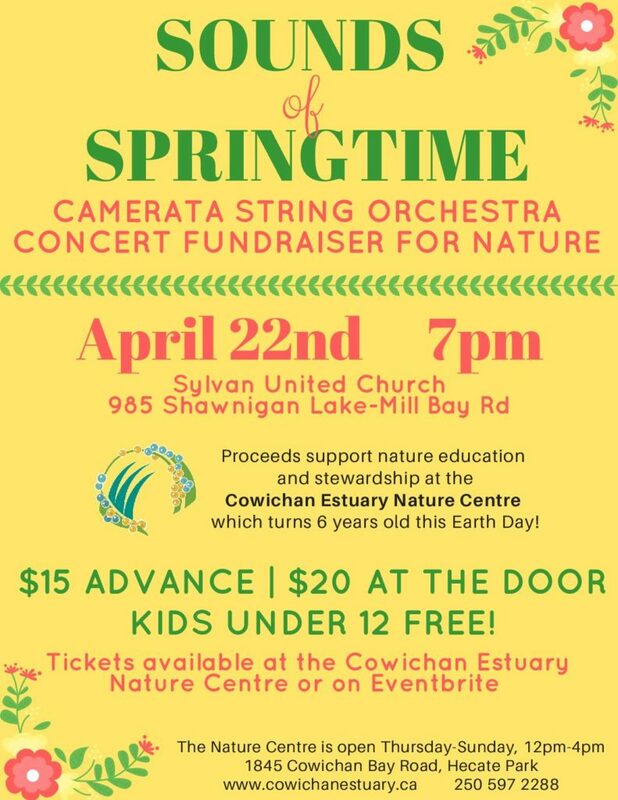 Admission by donation to support the work of both the Nature Centre & Transition Cowichan.